In Vietnam, Generation Z (or Gen Z) is a cohort that the Food & Beverage (F&B) industry needs to sit up and pay attention to. This group, born between 1994 and 2002, are now entering the workforce with disposable income to eat out of home. In fact, Gen Z accounted for 19% of total Out of Home visits in Q3 2017, according to the latest industry report from Decision Lab’s Foodservice Monitor. What’s more this group of diners has boosted their footfall to foodservice outlets by a whopping 46% compared to the same period last year. 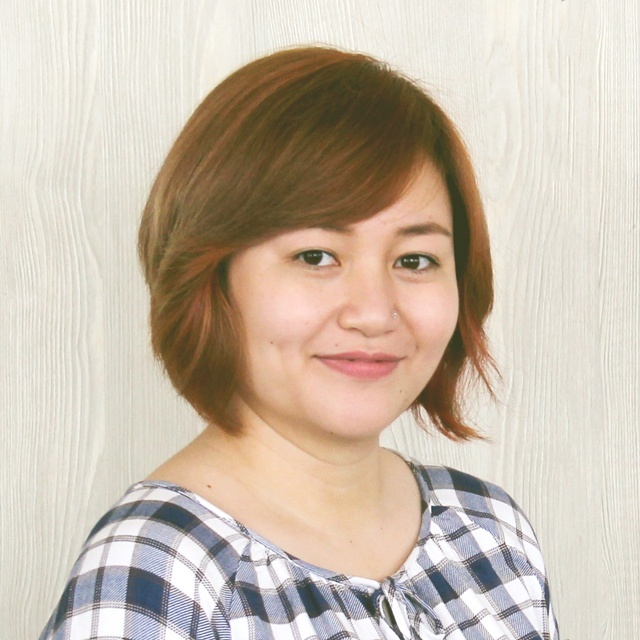 However, while Gen Z can be considered a mighty force in Vietnam’s foodservice market, this new group of consumers is unlike their predecessors and cannot be engaged with in the same way. For players in the F&B industry, here are five things you need to know about Generation Z. Unlike older consumers who tend to concentrate food and drink consumption into two main meals, Gen Z does not discriminate against eating times. Since many will be used to a relatively flexible school/work schedule, these youngsters can and choose to graze throughout the day. This leads to great potential for foodservice businesses who can utilize Gen Z’s all day eating habits to optimise low traffic day-parts, especially day-time snacking occasions. 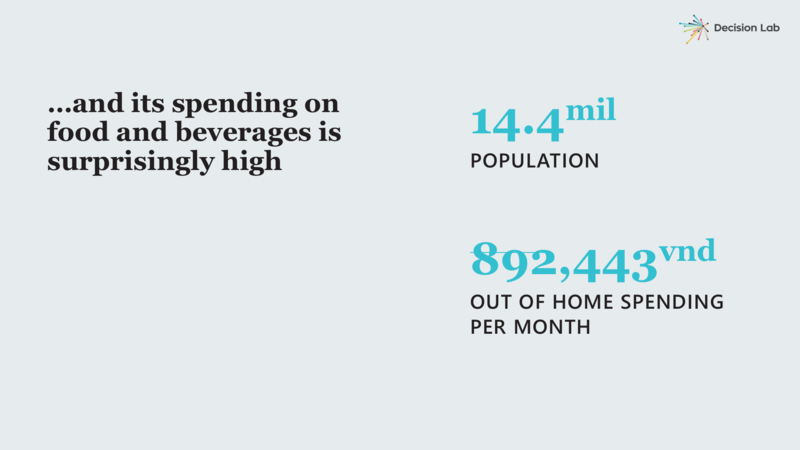 Despite relatively low incomes, as either students or first jobbers, Gen Z spends a high proportion of its money on purchasing food and drinks out of home, almost 900.000 VND (approx. 40USD) a month. 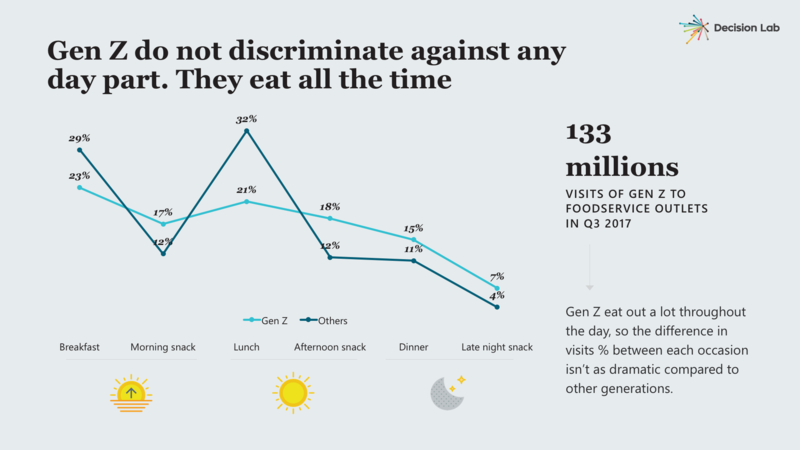 Decision Lab’s report also indicates that, unlike older generations, Gen Z spends a higher percentage of their money on snacks, as much as their main meals. Though it’s true that this group of consumers still has lower spending power than the wealthier, older cohorts, businesses should seriously regard them as the core target for future business growth. 3. 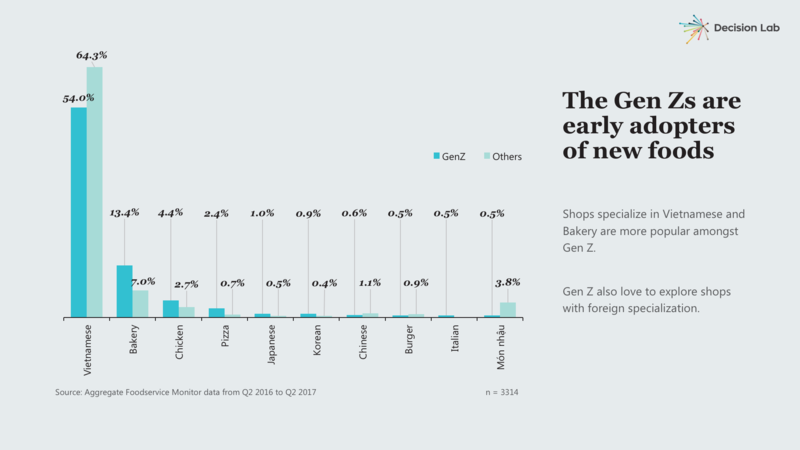 Gen Z are early adopters of foreign foods. As a generation with an innate crave for new, exciting things, Gen Z understandably makes much more visits to foodservice outlets specializing in foreign cuisines compared to other generations. Businesses focusing on foreign cuisine concepts should therefore revise their communication and marketing strategies to target this group of customers more precisely. Meanwhile, outlets specializing in Vietnamese cuisine can try to lure in the young by coming up with new dishes and adding a twist to its traditional menu to stay relevant and attractive. 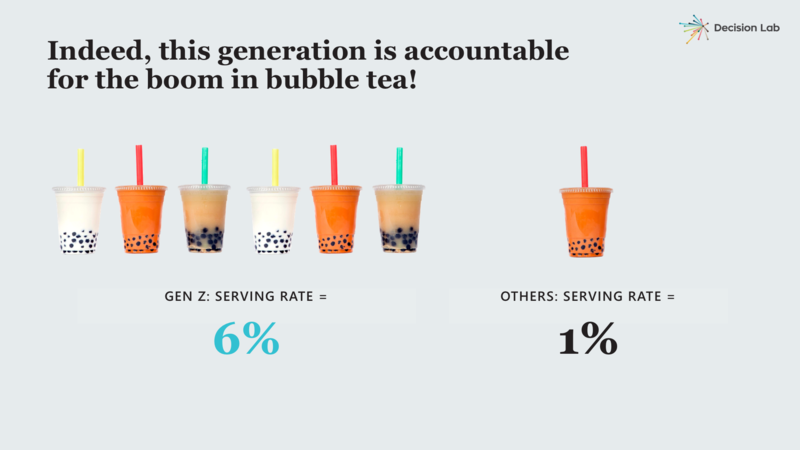 Bubble tea may well be Gen Z’s signature drink since they were six times more likely to consume it than any other generation. 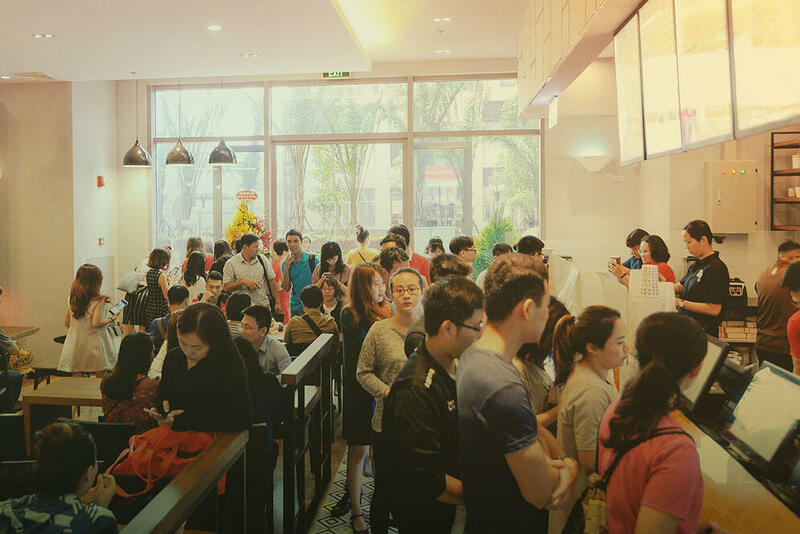 According to Decision Lab’s Foodservice Monitor their bubble tea passion lead to a huge surge in visits to bubble tea shops during the past year while their indifference to coffee beverages partly explained the decline in visits to coffee shops in 2017. Bubble tea is just one prominent example of how Gen Z can influence the foodservice market in fundamental ways, further emphasising why foodservice businesses should invest in understanding this generation. This is a generation that is on the loop out for new concepts and highly savvy about better offerings elsewhere. They are therefore harder to please and choosier about recommending an eating place, compared to other generations. 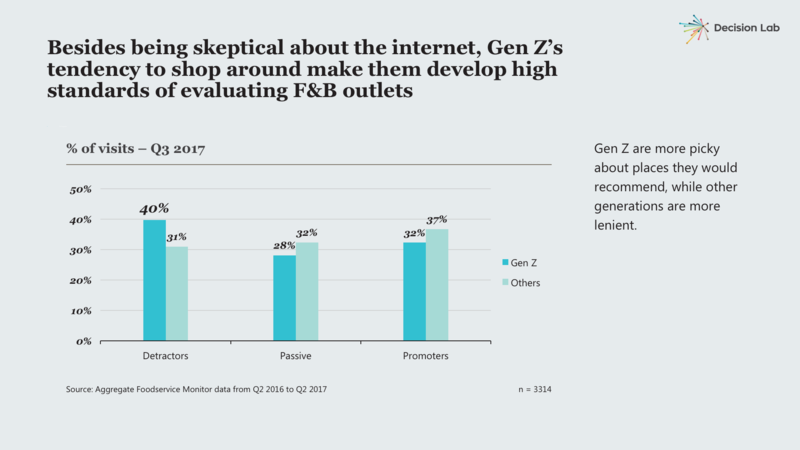 To win over Gen Z, businesses need smarter and more effective marketing strategies, along with ensuring real life positive consumer experience. All in all, Gen Z, with their increasing consumption power, deserves to be taken seriously by Foodservice players, both manufacturers and operators. While Gen Z notably differs from other generations posing unprecedented consumption behaviour, they are very much reachable and can become exciting challenges for businesses to win over. Decision Lab can help your company target Generation Z and build attractive offerings. Contact us to learn more.